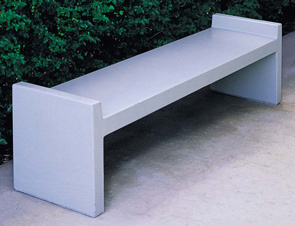 The simple straight styling of this concrete park bench maintains a sleek design and is very affordable. This bench is very competitively priced which allows you to increase your seating area without a lot of additional cost. This bench can be used indoors as well as outdoors. Made with reinforced steel rebar and Portland cement ASTM C 150. This park bench must be placed on a flat surface such as concrete.